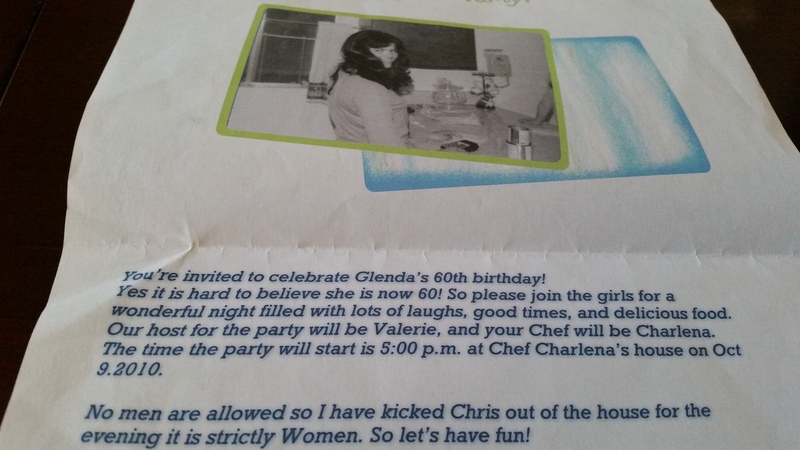 My mother’s 60th Birthday party is really where it all began. I had just realized that night I love to entertain make wonderful food for people to enjoy, followed by my love of baking. For my mother’s 60th I wanted to do something really special so I decided to make it a surprise birthday party with all of my aunts attending the party. I was on a budget for this event so I decided why not be the Chef and make my sister be the host. We both planned this out carefully together. I wanted to make the invitations since I am a stickler with buying cards I like to make things myself, and I believe they are more special that way. I had looked into trying to find a free downloadable software for windows and I came across this web site that was pretty easy to use and user friendly, Arcsoft Print Creations software. Then I thought about what would be a fun filled night for a bunch of women, make it a fondue night! I had recently bought a Fondue maker and knew this would be a great conversation piece for all of them since some of my Aunts have never done a fondue party before. As a matter of fact growing up as a little girl my parents use to have fondue parties so I knew my mother would love this idea. Ideas for a Fondue Party: You could make it a Cheese and wine party only with Appetizers, or you could make it a three course meal ( which I did that instead The ladies loved it) for a three course you could do first course Fondue with melted cheese and for dipping use sour dough bread, vegetables such as Broccoli, cauliflower, Whole Mushrooms anything that comes to mind that would taste good in melted cheese. the second course could be Meats, poultry and seafood. What I used for the 2nd course was Chicken breast, followed by cubed steak, and Jumbo Shrimp. There are all types of broths you can choose from to cook your meats in I myself looked for some recipes on the food network channel web site. The last course was a hit for sure, this course was dessert! I had made a plate of Cut up strawberries, Marshmallows, Graham Crackers, and sliced bananas. I then melted dark chocolate chips from Ghirardelli in the fondue pot( I swear by this Chocolate company the Chocolate is so easy to work with and I use their chocolate for most of my recipes that require Chocolate). The night was filled with laughter, lot’s of wine ( word to the wise do not let my sister drink more then one drink because that girl becomes the life of the party), and a whole lot of fun. My fondest memory this is where it all started for me. Here are some great sites that I follow check them out: Fondue party Ideas , More Fondue Party Ideas.